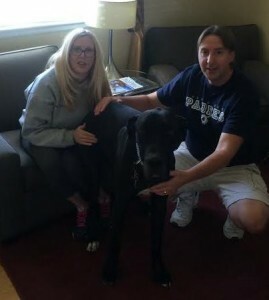 Willy has a home!!!! - Rocky Mountain Great Dane Rescue, Inc.
Willy has a home with his foster family in Louisville, CO Nicole and her husband have a vested interest in continuing the love and behavioral support that this sweet boy needs. They raised their hands to foster him and when he arrived into their home, they couldn’t imagine him anywhere else. Goodspeed Willy!